From traveling on the road with a circus to designing and building his own electric upright bass with the help of a luthier, Rusty Springfield has lived a life of music. Sitting at a local coffee shop, his red hair swept into his signature pony tail, the musician talks about his life and the different bands he plays in. Born in Memphis, Tenn., Springfield moved around the country before settling in St. Augustine in 2003. Playing in numerous jazz and funk groups and touring with the Ringling Brothers Circus and the Big Apple Circus in New York City, the bassist spent years honing his skills and his sound. "I think every musician wants to find their own voice, stand out from the herd a little bit," Springfield said. When he struggled to find that voice he drafted the help of a luthier (someone who makes or repairs stringed instruments). Springfield drew a design and explained the sound he was looking for in an electric upright bass. It took him a year to build the instrument. Fitted with a hand-carved ram's head and six strings, the bassist said, "It has become part of my signature sound because of its depth of tone and soloing capability. It's been my voice for 20 years now," he added. 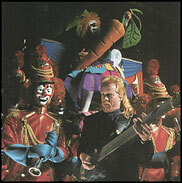 "Six months," say Rusty Springfield, bassist for the Ringling Brothers Barnum & Bailey Circus touring band. "That's about how long I thought I'd last. But playing for the circus is an interesting way of life and the travel is fun  besides, it's been a great alternative to a real job." An interesting life it must be. Imagine living on a mile-long train with clowns, showgirls, and man-eating animals on a cross-country 90-city tour. Imagine playing 600 two-and-a-half-hour shows a year with as many as three shows a day. And imagine playing every show in halls normally reserved for hockey games and monster-truck pulls. Not your average gig by any means! "We're the hardhats of the music industry," says Rusty, who has almost 1800 shows under his belt. "It takes a lot of concentration and discipline to do a gig like this." When the circus rolls into town, it's Rusty and the rest of a 15-piece band who provide the background music for the Greatest Show on Earth.